I've never been attracted by the Kiehl's brand that much, I don't know why, maybe because all the packaging look the same and it's overwhelming and I didn't know where to start. At the end of last year, I got two deluxe samples in one of my Deauty beuaty boxes and thought that would be lovely to finally try the brand. 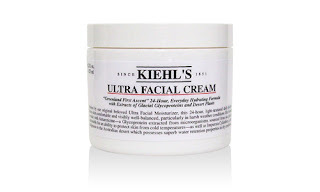 The first sample was for the Ultra Facial Cleanser which I used once, hated (because of the smell, for the most part) and that was it: I thought I'd really never like the brand and put both samples in a cupboard to give away. Fast forward to two weeks ago, for some reason I decided to give the other product, the Ultra Facial Cream, at least a sniff and maybe a trial. Absolute surprise: I loved it. So now I'm telling you everything about it. Inspired by our beloved Ultra Facial Moisturiser, this light-textured, 24-hour hydrator helps to retain moisture within the skin, leaving skin feeling comfortable and well-balanced. As the snow was doing a come-back after what we all thought was Spring, my skin freaked out again and I was out of any product that I felt would moisturizing enough and would be wearable during the day (e.g. not a mask). The texture is like a hybrid between a thick cream and a gel, it feels really nourishing but it does penetrate the skin easily and absorbs very fast. Despite the fact that it contains oil, this cream is not feeling greasy at all. It leaves the skin feeling refreshes, plumped and moisturized. I am in love with this cream and would absolutely purchase a full size jar. It reminds me a lot of my beloved Louis Widmer Switzerland Emulsion Hydro Active but in a richer, more Winter suited form. If your skin is dehydrated and sensitive/irritated, this is definitely a product you should try! Aqua, Glycerin, Cyclohexasiloxane, Squalane, Bis-PEG-18 Methylether Dimethyl Silane, Sucrose Stearate, Stearyl Alcohol, PEG-8 Stearate, Urea, Myristyl Myristate, Pentaerythrityl Tetraethylhexanoate, Prunus Armeniaca Kernel Oil, Phenoxyethanol, Persea Gratissima Oil, Olea Europaea Fruit Oil, Oryza Sativa Bran Oil, Cetyl Alcohol, Glyceryl Stearate, Imperata Cylindrica, Stearic Acid, Methylparaben, Chlorphenesin, Disodium EDTA, Propylparaben, Acrylates/C10-30 Alkyl Acrylate Crosspolymer, Carbomer, Triethanolamine, Prunus Amygdalus Dulcis Oil, Xanthan Gum, Sodium Hydroxide, PEG-8, Glycine Soja Oil, Tocopherol, Pseudoalteromonas Ferment Extract, Myristyl Alcohol, Collagen, Hydroxypalmitoyl Sphinganine ,Chitosan, Sodium Chondroitin Sulfate. I use this and find it very good!